With a stay at Holiday Inn Omaha Southwest, you'll be centrally located in Omaha, within a 5-minute drive of Baxter Arena and Ralston Arena. 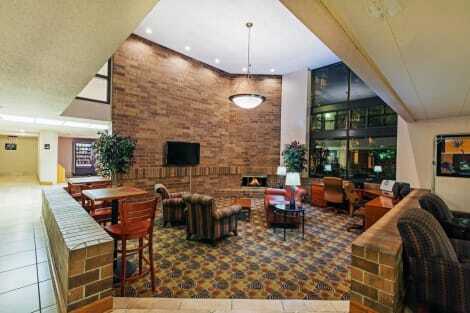 This hotel is 6.3 mi (10.1 km) from Henry Doorly Zoo and 8.2 mi (13.1 km) from CenturyLink Center Omaha Convention Center. Located in Omaha, Hawthorn Suites by Wyndham Omaha / Old Mill is within a 15-minute drive of Westroads Mall and University of Nebraska-Omaha. This hotel is 6.9 mi (11.1 km) from University of Nebraska Medical Center and 8.8 mi (14.1 km) from Ralston Arena. Featured amenities include complimentary wired Internet access, a 24-hour business center, and express check-in. Planning an event in Omaha? This hotel has facilities measuring 3994 square feet (371 square meters), including conference space. Free self parking is available onsite. 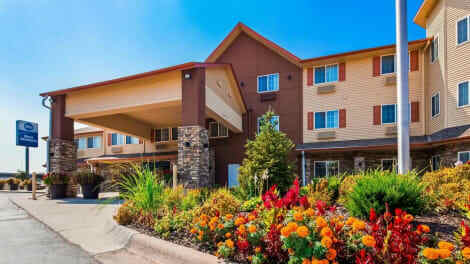 With a stay at Regency Lodge in Omaha (Northwest Omaha), you'll be convenient to Westroads Mall and Miracle Hill Golf & Tennis Center. 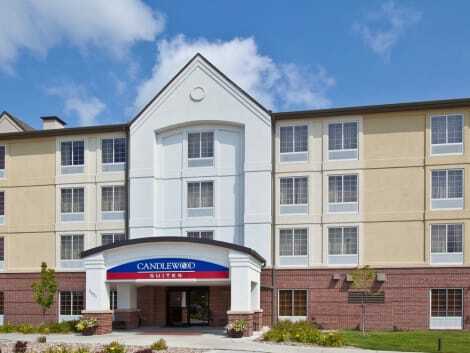 This hotel is within close proximity of OPPD Arboretum and World's Largest Ball of Stamps.Rooms Make yourself at home in one of the 144 air-conditioned rooms featuring refrigerators and microwaves. Your room comes with a pillowtop bed. Satellite television is provided for your entertainment. Bathrooms have complimentary toiletries and hair dryers. Take advantage of recreation opportunities including an indoor pool and a fitness center. Additional features include complimentary wireless Internet access, wedding services, and a fireplace in the lobby. Guests can catch a ride on the complimentary shuttle, which operates within 5 mi.Dining Grab a bite to eat at the hotel's restaurant, which features a bar, or stay in and take advantage of room service (during limited hours). Quench your thirst with your favorite drink at a bar/lounge. A complimentary hot/cold buffet breakfast is included.Business, Other Amenities Featured amenities include a business center, express check-out, and complimentary newspapers in the lobby. Planning an event in Omaha? This hotel has facilities measuring 3000 square feet (279 square meters), including conference space. Free self parking is available onsite. Make yourself at home in one of the 82 air-conditioned rooms featuring kitchenettes with full-sized refrigerators/freezers and stovetops. Wired and wireless Internet access is complimentary, while 36-inch LCD televisions with satellite programming provide entertainment. Conveniences include desks and complimentary newspapers, as well as phones with free local calls. lastminute.com has a fantastic range of hotels in Omaha, with everything from cheap hotels to luxurious five star accommodation available. We like to live up to our last minute name so remember you can book any one of our excellent Omaha hotels up until midnight and stay the same night.